"I have to stop you from getting on that train. For it will take you to your death." 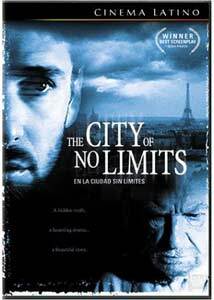 Judging from the DVD cover art and the blurb on the sleeve, one would think The City of No Limits (En La Ciudad Sin L�mites) would be a gritty, urban crime drama, dealing with illicit romance and mob violence. Yet nothing could be further from the truth. Antonio Hern�ndez's film is not a "gripping thriller" at all, but a methodical, deliberate mystery, fueled by cryptic family secrets and personal revelations rather than intrigue and double-crosses. Although the story chronicles the tribulations of a well-to-do Spanish clan, the type of chronic dysfunction depicted afflicts all ethnicities. Max (Fernando Fern�n-G�mez), the family's beloved elderly patriarch, lies in a Paris hospital, wasting away from a terminal illness. His controlling wife Marie (Geraldine Chaplin) summons their children to discuss his treatment options, but the reunion opens old wounds, and group discussions often degenerate into domestic squabbles. Relationship problems plague all the siblings�not surprising, considering the friction that exists between their parents�with fear of commitment a particular sticking point. Haunted by an episode from his past, Max frantically enlists his family's help in warning a man called Rancel about the grave danger he faces. Most of his kin dismiss Max's incoherent ramblings as the delusions of a dying man. Only Victor (Leonardo Sbaraglia), the youngest son, gives his father's desperate musings any credence. Sensing Max needs closure to meet a peaceful end, Victor sets out to find the elusive Rancel, with whom, we soon discover, his dad shared subversive political views a half century ago. Impeding Victor's progress, however, is the duplicitous Marie, who tries her best to throw her son off Rancel's scent. Uncovering his father's secret and the roots of his mother's lies begin to obsess Victor, who risks his relationship with two women to find the answers. The City of No Limits weaves a subtle spell as it gradually ties together its narrative threads. Hern�ndez possesses a fine visual sense, and beautifully conveys the delicate emotions that permeate the plot. Although a tighter focus on the mystery would give the story more tension, and the director's languorous pacing often tries viewer patience, the drama's tender yet penetrating themes see it through. The ultimate disclosure might seem anticlimactic, but the touching denouement lends the movie an unexpected resonance. Natural performances also distinguish the film, making us feel like we're spying on an actual family. Sbaraglia, one of Argentina's most famous young actors, effortlessly carries the film with his warmth and sensitivity. Though the mystery revolves around Max, Victor comes of age as he unravels it, and Sbaraglia's quiet transformation adds great depth to the film. Chaplin, however, is the real surprise, as the frosty, domineering mother guarding a shameful secret. Her angular features compliment her rigid, driven character, yet she wisely avoids playing the role as a one-dimensional villain. Instead, Chaplin shades her portrayal with subtle nuances to bring out Marie's hidden layers, and the striking result helps her steal the film. At its core, The City of No Limits explores the difficulties of not just accepting our parents' frailties, but embracing them. Antonio Hern�ndez's uneven yet affecting film shows us how hard that can be, and how a family's complexion can be irrevocably altered. The City of No Limits may not be the slick thriller we expect, but it's very satisfying drama. Image Transfer Review: The widescreen anamorphic transfer fills the screen with vivid colors and a crystal clear image. Fleshtones are natural and consistent, shadow detail is superb, and no grit or dirt sullies the print. Yet despite the marvelous clarity, The City of No Limits maintains its film-like feel, and the transfer's warmth and texture compliments the intimate story. Audio Transfer Review: The Spanish-language DD 5.1 track explodes across all channels, with exceptional fidelity and presence. Ambient effects gently waft over the rear speakers, and solid bass adds occasional emphasis. Dialogue is always clear and comprehendible, and Victor Reyes' understated music score nicely fills the room. An English stereo track is also included for those who prefer not to navigate the subtitles. Extras Review: Okay, so foreign films aren't necessarily big sellers on DVD, but such a fact doesn't excuse the complete lack of any supplemental material on this disc. Fox doesn't even toss in the film's trailer! And only a measly 13 chapter stops? Come on! The City of No Limits meticulously examines family dynamics, and the impact of one man's haunting secret on his wife and children. Although well-made and wonderfully acted, the film's laborious pace keeps it at arm's length much of the time. Still, fans of fine, personal drama will find a rental rewarding, and will surely appreciate the first-rate video and audio transfers.